Sony will be shooting out an update on Thursday to allow the Reader to use purchased books in the protected EPUB format from whoever is peddling them, instead of being tied to the Sony’s e-book store, or just DRM-free text and PDF documents. This is an excellent move by Sony. 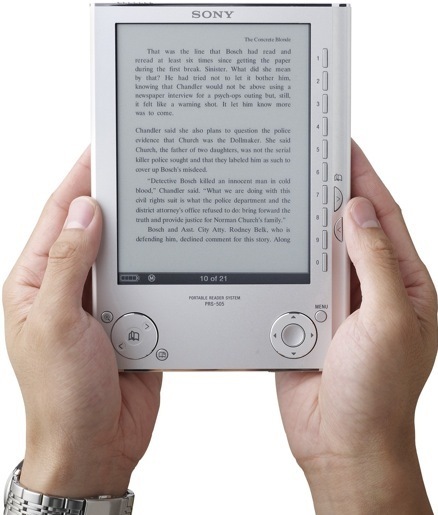 One of the big downfalls to both the Sony Reader and the Amazon Kindle was the fact that you were tied to the devices’ respective stores for content. We’ve recently seen yet another example of why DRM is bad when applied to music purchases [Yahoo Music Goes Dark, Takes DRM Keys With It], and I think that the same will hold true for ebooks as well. Now, you can load your own DRM-free TXT and PDF files onto the Sony Reader, expanding your content options. If you still want to buy from a major seller, you can buy from anyone using the EPUB system. It’s still DRM, but at least you’re no longer stuck with Sony’s offerings. I haven’t seen an Amazon Kindle in person yet, but from the photos I think I like the industrial design of the Sony Reader much more. We’ll see what happens if Amazon releases new Kindles in October as rumored, but right now I don’t mind the thought of picking up a Sony Reader on clearance in a year or two.